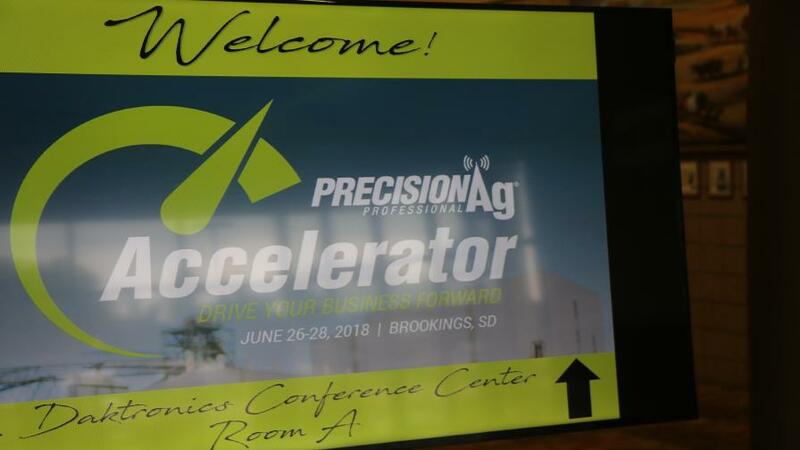 The first-ever PrecisionAg Professional Accelerator meeting was held June 26-28 in Brookings, SD, about an hour south of Sioux Falls. An attentive classroom of 50 precision agriculture managers gathered in Brookings, SD, in June for the inaugural PrecisionAg® Professional Accelerator, a three-day professional development program. The event was sponsored by EFC Systems and Raven Industries and co-hosted by South Dakota State University (SDSU), home to the nation’s first four-year precision agriculture degree. The program kicked off with a discussion of the state precision programs, introduced by Dr. Bruce Erickson of Purdue University and John Shanahan of Fortigen. Erickson has been involved in the CropLife® magazine/Purdue University Retail Precision Adoption Survey for several years, a project that dates back to the late 1990s and is one of the most respected and referenced precision benchmarking surveys in the world. Nicholas Uilk and Douglas Prairie of South Dakota State University followed with a summary of pre-event survey data on the most popular approaches to capturing revenue and expressing value through precision programs. Day Two featured Purdue University Distinguished Professor Michael Boehlje, who used lecture, case studies, and small group exercises to examine the profit opportunities and challenges in attendees’ precision programs and provide a foundation for creating a more robust business plan. Day Three was driven by Consultant Phil Ramsel, who turned the program focus inward on personnel and effective team building and retention. Ernie Chappell, President and CEO of EFC Systems, an education sponsor of the event, says it was a truly unique educational experience. “It was great to see so many younger generation attendees at this event,” he says. “It was presented in a very different style than we typically see — it was very engaging, really an education workshop. We saw a lot of openness, and everybody was there to learn. Raven Industries, which also served as an education sponsor, has deep investment in the SDSU precision program and is a big believer in precision program training. The training aspect of precision is critical to Raven. “Having the trusted advisor, who’s making those recommendations to farmer-clients, and trained as possible is critical,” Shane Swedlund, Raven Industries Facility and Engineering Manager, says. Profit is often not the biggest driver of precision programs. In their opening presentation, SDSU’s Uilk and Prairie discussed the variety of approaches that service providers are taking to price out precision services, including “bundled per acre,” “per pass,” and “per unit of product.” What was particularly interesting from the discussion was the follow-up question: How does your location perceive the success of a precision ag pricing model? Nearly half of respondents indicated that the “ability to increase customer loyalty and retention” is the leading factor in the perception of success, significantly higher than the 32% pointing to gross sales of products. Immersion in technology enhances technology adoption. One of two case studies presented during the program featured the cooperative Agtegra, based in eastern South Dakota. Highly progressive and committed to investment in technology, Agtegra described some of its big ideas, including its gleaming new Innovation Center. The building is a combination training center, parts depot, and precision ag immersion experience in which farmer-customers can see and better understand technology options. The training center can seat 300 individuals, and machinery of all colors is in house so farmer customers can see the possibilities of technology regardless of what brands they use. Precision ag as a profit center. Boehlje’s day two was filled with superlatives, a fun argument about managing grower service hour expectations (do we really need to work 24/7?) and various other interesting and at times hyperbolic statements. 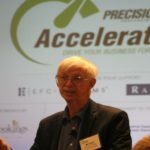 But the clear theme of his presentation was that ag retailers looking to grow or increase precision services revenue needed to “make their precision business a profit center, not a cost center.” Or, basically, stop focusing or devoting equal resources to staffing out services that deliver only a benefit for the grower and not much profit for the cooperative. Ag retailers have to find and implement those services that are both beneficial to the growers’ bottom lines while also driving increased revenue to their bottom lines. If cooperative management isn’t happy, nobody’s happy down at the fertilizer shed.